ALIPR Helps People Decide: Hot Or Not? An amazing innovation in the software world today: ALIPR (Automatic Linguistic Indexing of Pictures) is a program that takes a look at digital images, applies some fancy math and then spits out a list of appropriate tags for the picture. It isn't perfect, but the designers claim it has a 98 percent accuracy rate. They've been letting it dig through Flickr and the software has matched at least one user-defined tag almost every time. Try it out for yourself. 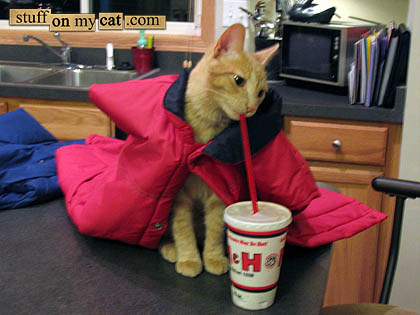 The image above of a cat drinking a soft drink yielded the following fifteen results: man-made, texture, color, people, indoor, food, painting, royal_guard, fruit, feast, holiday, mural, cloth, abstract, guard. Not all words I'd choose to describe a thirsty kitty, but not bad for a bundle of electronics.